Your vehicle is equipped with a barrier net. 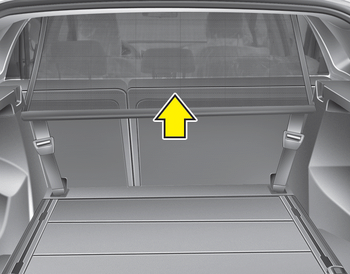 When you load some cargoes on the rear seat or rear cargo area, you must install the barrier net behind front seatback or rear seatback. It is designed to help protect the heads of the occupants by obstructing objects flying forward in frontal collisions. There are eight hook holders on both side of the headliner over the headrests for upper side fixation and on the floor behind the front seats or rear seats for lower side fixation.